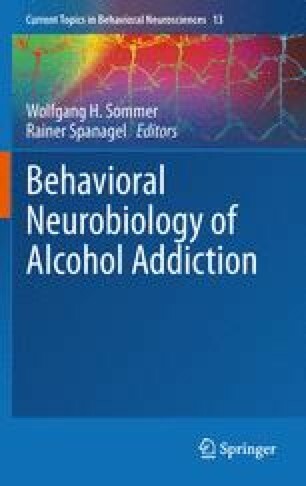 The brain reward system, and especially the mesolimbic dopamine pathway, plays a major role in drug reinforcement and is most likely involved in the development of drug addiction. All major drugs of abuse, including ethanol, acutely activate the mesolimbic dopamine system. Both this acute drug-induced dopamine elevation, the dopamine elevations observed after presentations of drug-associated stimuli and alterations of dopamine function induced by chronic drug administration are of importance. Whereas the mechanisms of actions for central stimulants, opioids and nicotine in their dopamine activating effects are fairly well established, the corresponding mechanisms with respect to ethanol have been elusive. Here we review the actions of ethanol in the mesolimbic dopamine system, focusing on ethanol’s interaction with ligand-gated ion-channel receptors, opiate receptors, the ghrelin system and the possible involvement of acetaldehyde. Preclinical studies have provided the opportunity to dissect these interactions in some detail and although we do not fully comprehend the actions of ethanol there have been some great advances resulting in increased knowledge of the complexity of ethanol’s mechanism of action in this system.